Ad: Entertainment Earth added a ton of new Hasbro pre-orders! Lots of Marvel, Star Wars, Transformers, and more await you if you get them before they sell out. Get that 6-inch Han Solo with Tauntaun now! Why wait? Pre-order yours today! Ad: Entertainment Earth has over 2,000 items on sale at crazy prices! Lots of Batman, Star Wars, Star Trek, and more await you if you get them before they sell out. They're cheap, so get yours before they're gone forever - these special sales all end next Tuesday! Ad: Entertainment Earth has nearly 700 items on sale at crazy prices! Tons of new items are on sale today. Lots of Batman, Star Wars, Star Trek, and more await you if you get them before they sell out. They're too cheap, so get yours now! Ad: Entertainment Earth has over 600 items on sale at crazy prices! Star Wars Han Solo Hoth Jumbo Kenner Figure for $37.20! Order Action Figure Stands 25-Pack - Clear for $5.20! Save 40% on a Star Wars Sy Snootles Max Rebo Band Mini-Bust! Just hurry, because these special prices end soon - sooner if the stuff sells out. Ad: Star Wars Lightsabers up to 25% Off at Entertainment Earth! For one day only, get a big discount on FX and Ultimate FX Lightsabers. Click here to check availability and hurry, because the deal ends at Midnight! Also get Free Shipping on in-stock orders $79 or greater! Many of you have asked me "What tackle boxes do you use to store your 3 3/4-inch Star Wars figures?" There are two kinds, but one of them is actually on sale now on Amazon. A Plano 2-3700 Prolatch Stowaway 4-pack (you'll want more) should store about 48 standard-sized figures, and it's $17.99 with free Prime shipping, click here to get it. Also, Amazon has a small suite of Star Wars deals, but nothing crazy - some half-price figures, a few older games, and so forth. If there are deals being held back for the real Black Friday, we don't know them yet, but you can click here to see what they're calling their Black Friday specials right now. Ad: New from Diamond Select Toys, it's the Entertainment Earth Exclusive Star Wars Landspeeder Bottle Opener! This sturdy metal bottle opener is for drinking when you're not driving. It features magnets on the bottom so it can stick to your fridge, or you can hide it in your desk at work. It's due early next year, so click here to pre-order yours now! Ad: Order new Star Wars at Entertainment Earth! New cases are shipping out, and many are still in stock. Get the new The Black Series Hoth Luke and R5-G19. Click here to see dozens of in-stock recent arrivals from The Black Series including the hard-to-find 6-inch Clone Trooper and so much more. Ad: Star Wars The Black Series Wave 6 Action Figures are up for grabs right now! Due around December, the wave has 3 new faces and 1 returning face - click through to pre-order yours now (and get free US shipping to boot)! UPDATE: Sold out. Note the DPCI and keep an eye on your local store! There aren't many big exclusives left for 2014, but you can cross one off your list today! Target.com has the Star Wars The Black Series Imperial Shadow Squadron Pack in stock for $50.00 plus free shipping. Unless you're up for playing a round of clearance chicken, you can save yourself a lot of post-holiday anguish by ordering yours now. Ad: Entertainment Earth has listed several new Hot Wheels Star Wars assortments with partial breakdowns - new character cars for Rebels and more are listed. Want to know more? Click through and see what's up for grabs! It's time! 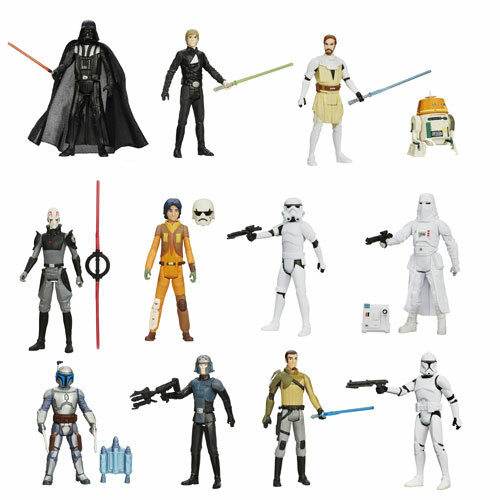 Pre-order a Star Wars Saga Legends Action Figures Wave 4 Case right now and get the first 6 animated figures from Rebels as well as 3 of the Canada-only Saga Legends movie figures from this past summer. 3 returning favorites are on deck too, all in new packaging! Pre-order yours today - Chopper, Ezra, Kallus, Kanan, the Stormtrooper, and the rest are all due soon. Ad: The new guys are up for order! Click here to order Funko Alien ReAction Series 2 Figures at Entertainment Earth. New figures include Metallic Alien, Spacesuit Ripley , Kane with Chestburster, and Kane with Facehugger. These figures are due in November. These are all in the style of the awesome first batch of figures, which were based on actual 1979 Kenner concepts for unproduced figures in the style of the original Kenner Star Wars toys. See pictures after the break! BBTS News:Star Wars, Play Arts Kai, Transformers, Marvel, DC, Revoltech & More! Here are the latest new arrivals and pre-orders from our sponsors at BigBadToyStore, including the latest The Black Series 2014 Wave 3 with Episode V Hoth Luke, Darth Malgus, Starkiller, and Episode III Darth Vader. Browse and shop the listing after the jump!